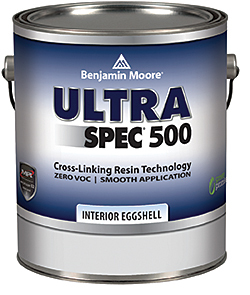 Ultra Spec 500, a zero-volatile organic compound acrylic interior paint, is suitable for most commercial settings — including hospitality and government facilities and corporate offices — and it qualifies for a LEED credit. The faster-drying formulation ensures same-day return to business. The paint remains VOC-free after tinting, regardless of the color choice. It provides high hide and broad coverage when rolling or spraying, delivers a smoother application with a better flow and leveling, and is durable and washable for high-traffic areas.